Carlisle Bridge, the most frequented passage between the northern and southern sides of the city, forms the limit of the navigation of the river—vessels of considerable burthen being able to come close up to it at high-water. The panorama of the river and the city which encircles the spectator on this bridge, is unequalled in grandeur and beauty by the noblest prospects which could be obtained from any single point in any other European city. We remember, several years ago, having been so struck with the splendid though solitary picture which presented itself while standing on Carlisle Bridge, soon after sunrise on a glorious summer morning, that we committed to paper at the time our impressions of the scene. The pages containing them are now before us, from which we shall extract so much as may be relevant to our present purpose. "Philosophers and writers have, according to their temperament or caprice, selected for themselves different places for meditation. Some have chosen to bury themselves in the deep recesses of an ancient wood, where 'day's garish eye' could scarcely penetrate the thick canopy of leaves which overshadowed them: some have delighted to fling their 'listless length' beside a babbling stream, lulled by the murmur of its gentle song: some have wandered, rapt in fancy's dream, in the delicious wilderness of a flower-garden: some have mused by the wave-beaten shore, and others in the deep seclusion of a cobwebbed library. But, for our part, we know of no situation more calculated to awaken feelings of deep awe, or to call up images of universal desolation, than the silent, solitary streets of a great city, viewed through the purple haze of an early summer's morning. Almost every person living in Dublin has, at one time or another, experienced the solemn effect produced on the mind while standing on Carlisle Bridge at daybreak on a calm morning in June. How full of strange beauty is the scene!—all is hushed and still as death—not a sound disturbs nature's profound repose, save at intervals the shrill bark of a watch-dog from the decks of some of those numerous vessels lying below the bridge, whose taper masts shoot like a forest of leafless pines into the cloudless sky, which has already begun to assume the lady Aurora's livery. Far as the eye can stretch on the other hand, the silent quays and bridges reflect their shadowy outlines in the still waters that sleep within their bosom; or if a dimpling circle should break the mirror-like surface of the tide, it is but caused by the rapid wing of some hungry swallow pursuing his insect prey. 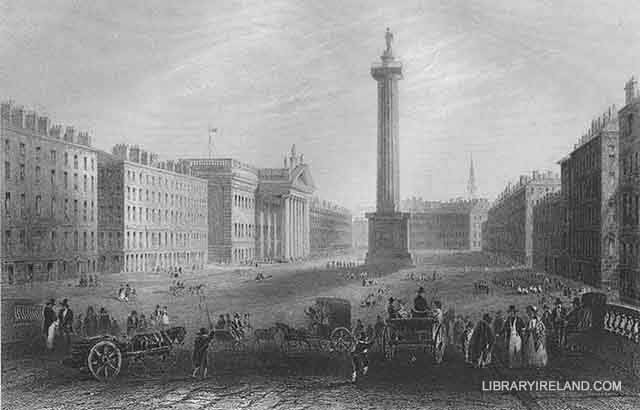 "Behind us lies Westmoreland Street, terminated by the ancient walls of Trinity College, and the noble Corinthian portico of the Bank of Ireland; on the opposite side of the river, Sackville Street extends its full perspective of architectural beauty—uninterrupted, save by the memorial of the brave Nelson, whose pillar seems to have been dropped there in defiance of all the laws of good taste. Let us walk up this beautiful street: we are now opposite the Post-Office,  and who can say that the republic of letters is declining, when they look upon that magnificent pile? But allons! for while we remain here we are preventing the poor pigeons, who are fluttering about the cornices and pillars of the portico, from seeking for their early meal in the silent streets. Before us lies the Rotunda, where revelry so often holds its court, while 'meek-eyed charity' extends its hand to succour the children of misery. Let us now turn round, and survey from this eminence the splendid scene which lies before us:—the deserted streets, like the exhumated cities of Pompeii and Herculaneum, seem but as the monuments of departed splendour. Where is now the dark line of moving forms that a few hours since thronged these footpaths? where the waving plumes and the glittering equipages? where the merchant's busy face, and the proud beauty's conquering glance? All fled! there is no form of life—no vitality in the scene—and thus will the resistless scythe of Time sweep these streets of palaces, and the antiquary of future ages will seek in vain for some relics of those noble works of art that we presumptuously hope may outlive the great destroyer himself." The Nelson pillar consists of a pedestal, fluted column, and capital of the Tuscan order, surmounted by a statue of the naval hero. The entire height of the pillar and statue is one hundred and thirty-four feet four inches. From the top an extensive view of the city, the bay, and the surrounding country will well repay the trouble of the ascent. This superb edifice, of which the foundation stone was laid in 1815, is two hundred and twenty-three feet in length, one hundred and fifty in depth, and fifty feet in height. The grand Ionic portico in front imparts a striking air of grandeur to the building, which adds considerably to the architectural beauty of Sackville Street. The Rotunda, which stands at the extremity of Upper Sackville Street, is united with the Lying-in-Hospital, and with it forms a very distinguishing feature in the city. The circular room of the Rotunda is eighty feet in diameter, without any central support. Balls, concerts, and public meetings for festive or serious purposes are occasionally held in this room, from which the funds of the hospital derive much support. Formerly, when the nobility and gentry of Ireland had their town residences in Dublin, the subscription-balls, card-assemblies, and masquerades of the Rotunda, were regularly and fashionably attended throughout the winter; and the public promenades on the terrace of the ornamental gardens, formed in summer unfailing attractions to the lovers of pleasure. The promenades alone have survived as a regular entertainment; on certain evenings in the week during the summer season, the gardens are still open to the public at the trifling admission-charge of sixpence. The terrace on these occasions is illuminated, and one or more military bands contribute to the gaiety of the scene.